Rob O'Donohue, Making my way in the World Today! The forbidden fruit must NOT be tasted! 2. We talk about drinking A LOT! When I wasn’t on a self-imposed alcohol ban, it never struck me how often alcohol or drinking comes up in conversation. It’s just not something I was that aware of when it wasn’t off the table. But, when you’re dry, you begin to hear how intertwined it is in conversation and how much it’s a key part of socialising. Maybe I’m stating the obvious. It’s certainly amplified when it’s off-limits. It’s somewhat analogous to the situation you might find yourself in when looking for a new car. You identify a model that takes your fancy. One weren’t aware existed before. Now you have this awareness of it and, ever since, it’s the only car you see on the road. They are, literally, everywhere. Ok, what is called the ‘frequency illusion’ maybe a poor analogy here, but my learning is that drink is still very much engrained in our consciousness. It may have been even more focal 10 years ago. Before the coffee shop boom, the pubs, instead of Starbucks, were busy on a Tuesday evening. That’s progress I guess. I have to be clear. 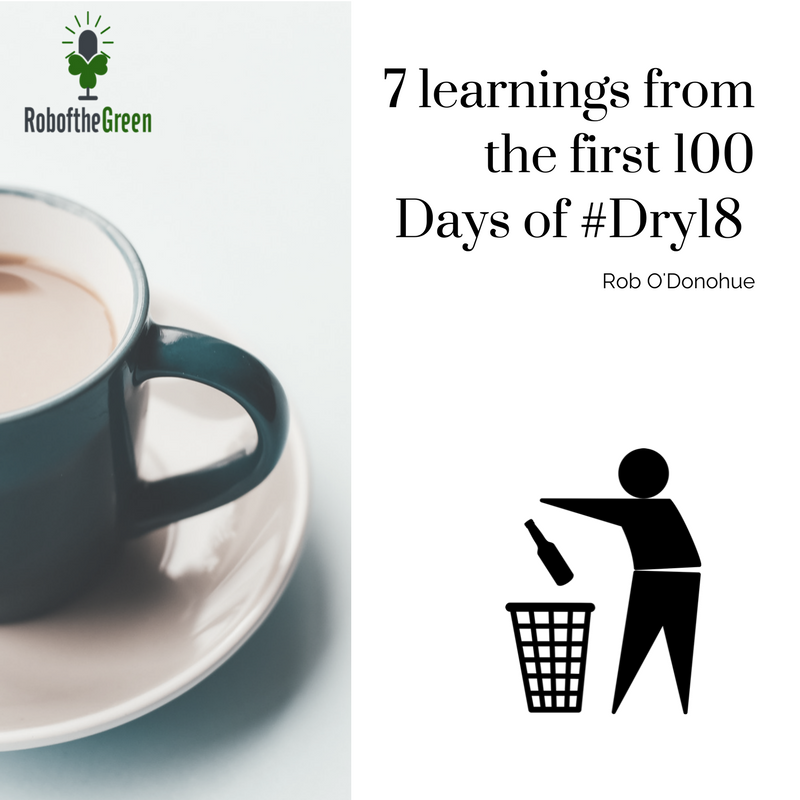 At the point of starting out on the #dry18 challenge, I considered myself very much in control of my alcoholic consumption. Much more so than I was 10 years ago. So, going into it, my reasons for doing it were more to squeeze more out of my days and weekends than to detox. However, so far, it’s been very interesting to see what others reaction to is has been. I’ve generally observed three responses. The most common reaction was a raised eyebrow and a sense that the person I was talking with might have thought I had a problem upon hearing I was ‘off the drink’. At which point, I’d find myself having to give a detailed explanation as to why I’m doing it. I noticed my need to be explicit and clarify that I didn’t have a drinking problem. That seemed to be the default place many folks were going to when hearing I was giving it up for the year. The irony here is that I’d never been more in control of alcohol intake than I was leading up to the crafting of the bet. The second most common response was that it’s just a bad idea in general! To deprive yourself of a relaxing glass of wine or bottle of beer over a meal or at the weekend doesn’t make sense to a good section of those I’ve chatted with or know. When you’re in control of it already, why deprive yourself? Fair point & one I’m probably in most alignment with now! The third and final category turned out to be more common than I expected. Those that think it’s a great idea and have confided in me that it’s something that they’d love to do themselves. It’s probably the stage of life many are at. Around the 40 mark and keen to curtail or stop drinking altogether. That the downside or after effects outweigh the upside of a few drinks being the logic behind this thinking. I concur! For the last 22+ years, my self-imposed ban probably lasted 4–5 weeks max. Prior to Dry January in 2017, I hadn’t abstained much. So, going into the start of the year, I was interested to see how this experiment would play out. What I’ve learned about my own decision making over the last few years has played out again with this challenge. It can take me a long time to make a decision or commit to something. Especially when it’s a big one. But once I made a decision, and also opt to tell everyone I know about it (whether they care or not), it really ups my level of accountability to it. 5. St. Patricks Day Overthinking! As it transpired, this St. Patrick’s Day was to be a 4-pronged attack. I had a Friend’s 40th Birthday to attend. If that wasn’t bad enough, the location was to be Galway. Anyone that has been to the city of the tribes knows that it’s not a quiet place. Finally, to really put the icing on the cake, the Irish Rugby team were playing their last game of their Grand Slam winning 6 Nations against the old enemy, England. Kicking off was at 2:30pm. On St. Patricks day. The 4-leafed clover was complete. Arriving in Galway in time for the match kick-off meant I had a solid 10 hours in packed pubs ahead. I had this already played out in my head as a big struggle! As the night came to an end, and after switching from zero percent Pauliner to Apple juice, I decided to make what’s known as an Irish-Goodbye! As I left the pub, the party was still in full-swing. I had survived the day. Survived might be too strong a word. I enjoyed a lot of it to be fair. And had made the effort to be there for my mate. We all are keen to do the right thing and keep everyone happy. But it’s key to make sure you’re happy first. Nobody else really can do that for you. I had built up this day in my mind for a few weeks as the first real big test! I am often guilty of overthinking things and this was one of these occasions. Anyone could try to hide away for a year but then that wouldn’t really have tested out the experiment. Galway on St. Patricks day could be considered an extreme test. But it was one I learned a lot from. 6. The Fear still exists. Just way less. As I’ve progressed in years, my resilience or ability to recover from a night out or an ‘all day session’ that many of us have been on, has taken many steps backward. You might remember the time when you could socialise two nights at the weekend and be fresh on the Monday. Well, for me at least, those days/nights are long gone! Over the last few years, one night out would take me a few days to recover, and it would need to be a Friday night, so I’d be able to fully function again by Monday. Physically, I’d be pretty ok. Emotionally and Mentally, I’d be fragile. What is known as the fear is just not fun at all. So, I was very much looking forward to not experiencing this phenomenon in 2018. What I’ve learned here has been interesting. In the past number of years, I would have blamed a moody Monday or even a terrible Tuesday on an excessive night out over the previous weekend. I’d give myself an extra hard time over those days and resolve ‘never again’ and all that goes with that self-defeating attitude. Since the 1st of January, I can now say that sometimes the Mondays or Tuesdays (or even Wednesdays or Thursdays) can still be tough. Never full on fear but still be dotted with anxiety, stress and overwhelm. My default, in the past, was to blame it on partying at the weekend. This would/could spiral into self-defeating territory again. Now, with that variable out of the equation, I’ve concluded that it’s ok sometimes not to feel ok. That’s part of being human. Bad days will come. Just accept it and move on. 7. Win the morning with the rule of 3! Over the years, wasting mornings, days and time in general has become a big annoyance for me! The older I’ve become, the more appreciation I have for the time I have and how much I can get done with it! So, without doubt, one of the benefits I was expecting and looking forward to with zero days wasted during 2018 was that of increasing productivity and learning new things. #Dry18 is my BHAG for the year (check out my post on goals for the years from December here) and, as I finalise this piece, I’m on day 113. Overall, I’ve been surprised at how smooth it’s been to cut it out. Not easy but totally worth it! In the vast majority of cases, I’ve received great support and words of encouragement. I wanted to challenge myself, first and foremost, to see what life, especially nights out and social events, would be like without any alcohol as the focal point. I wanted to learn or maybe re-learn how to actually have fun and enjoy myself when I’m out completely free of alcohol. It’s been an eye-opening experience so far. Almost 1/3 of the way through, and with the summer sunshine, beer gardens, cold cider, vacations, and many more temptations coming in the next 100 days, I’m sure new challenges and learnings are ahead! Maybe it’s a good thing after all that Ireland didn’t qualify for the World Cup in Russia! One nice observation that has come in just in the last couple of days is that I seem happier. Much like meditation and it’s benefits, I think others close to you see changes before you do. Upon hearing it, and taking a moment to process it, I would have to agree. That would be number 8 and probably the most important of all if I could dare include it. Rob is a qualified Executive Coach and holds the ACC credential from the ICF. He has been Mentoring and Coaching over the last decade in various roles held during his career. In 2017, Rob launched the Rob of the Green Platform which hosts the 1% Better Podcast. Rob currently is a director of strategy and business operations with Dell IT in Cork, Ireland. Rob also publishes articles on productivity, goal setting, meditation, and other topics. Originally published at Rob of the Green. 41 Years on the planet (by the time you read this, probably 40). Started to realize purpose, fulfillment, and satisfaction are all very much intermingled only a few years ago. Waking up more every day since. Now focused on helping others find out their own why, how and what using both sides of my brain to do so! Mindfulness is a game changer. Lots more to come in 2018! 2018 Goal setting with the Heart & Mind!